You can get to most parts of New England by bus. Boston MA, Springfield	MA, Providence RI and New York City are the main terminals. With limited train service in New England, bus is the best way to travel to certain destinations if you don't have your own car. 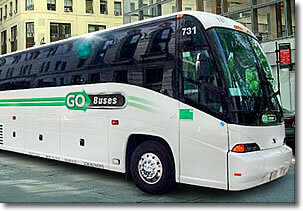 The principal bus route hubs are Boston MA, Springfield MA, Providence RI, and New York City. The major bus routes to New England from Chicago and Toronto enter the region at Albany NY, Montréal QC, and New York City, and you may find yourself changing buses at one of these points to reach your final destination in New England. 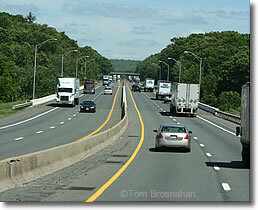 The distance by road to Boston from Chicago is almost 1,000 miles (1,500 km), from Toronto 550 miles (860 km). Boston - New York City route.